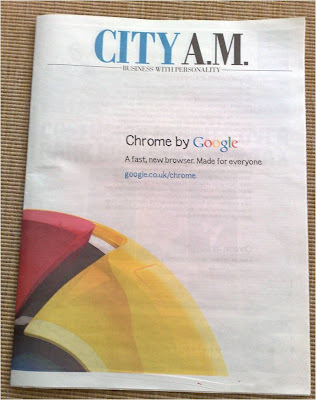 Google are advertising Chrome in UK newspapers, but rather than just running ads, Google Chrome has coverwrapped both Metro and City AM. 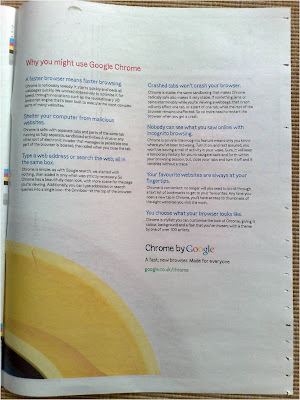 Using the strapline 'Chrome by Google. A fast new browser. Made for everyone', the execution aims to highlight the benefits of Chrome vs other browsers. 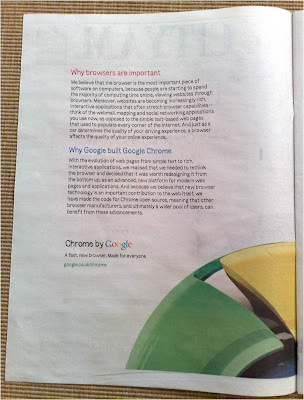 Google has traditionally relied on Word Of Mouth to promote offerings, so it is interesting to see Chrome being pushed so prominently in 'traditional media' / newspapers - especially coming so soon after Google used print and buses to promote YouTube's new professional content. Google have also been projecting giant ads onto the side of Westfield Shopping Centre in Shepherds Bush. They were giving away free chocolate advent calenders. All trying to promote Chrome. 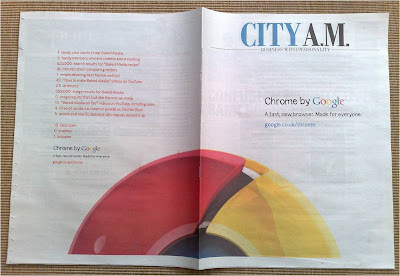 A large format outdoor campaign seems to have launched too - though I would have liked a Google Chrome advent calendar!